06/08/2011 11:00 AM - On June 18th the Barnstormers take on the Dallas Vigilantes at 7:05PM on Wellmark Field. 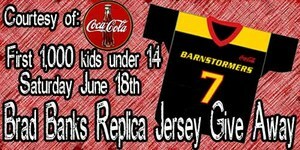 The first 1,000 kids under age 14 will receive a replica Brad Banks jersey. These jerseys are courtesy of Coca Cola. Click HERE to get tickets! Or call the office at 515-633-2255 to purchase tickets.